In the past 30 years, technology has grown in leaps and bounds and has benefitted all industries, especially the medical industry. The surgical procedures for hair restoration have seen a huge advance with both new techniques and more natural and permanent results. Until there is a magic pill which regrows hair, hair transplants are the best and most efficient way to achieve a full head of hair. Unfortunately, as surgical and technological advances continue, prices for hair replacement have in some cases become prohibitive. Because hair loss surgery (elective) in most cases is not covered by health insurance, the patient cannot afford the cost and will either forego a transplant or will resort to a less natural solution. Fortunately, there is an alternative solution, although it still includes a quality hair implants. What are my options on saving money for a Hair Transplant? Only a small percentage of us have the money to finance such an expensive medical procedure in the UK or Ireland. Thankfully, for those living in these countries, there is a solution which will provide affordable and high-quality hair loss treatment. The answer lies in Hungary, the top country for Medical Tourism. For more than a decade, Hungary has been the number one destination for those looking for medical solutions abroad. Being strategically placed, the UK and Ireland have a selection of inexpensive flights direct to Budapest which can be reached in just over 2 hours. And with the cost of airfare, lodging and other expenses included, you can still save over 60% on the cost of hair transplant surgery. Our knowledgeable staff will assist you with all your travel needs so that you feel at home when you arrive in Hungary and have your surgery. Is the quality as good as in the UK and Ireland? Although your procedure in Hungary is significantly less expensive, the quality and procedures are on the same level and in some cases even better. The FUE Safe System method is the preferred procedure used and is the most highly advanced technique in the industry. This is a far cry from the Hair Plugs of the 1980s and uses the Follicular Unit Extraction (FUE) method where 1-3 hair follicles are harvested and placed into the donor area. London, Manchester, Liverpool, Cardiff, Leeds and Birmingham are the cities where you can get a free evaluation and consultation. This is beneficial as the cost of your procedure is not just a guesstimate but a personal medical evaluation of the cost of your procedure and what type of procedure will be done. There are no surprises, and with the multi-lingual staff in both the UK and Budapest, nothing will be lost in translation. Why should I come to Budapest from my hair transplant? Cost, Quality, Care and the beauty of Budapest are the 5 reasons to come here for your hair transplant surgery. It’s no wonder many patients spend an extra 2-3 days here to enjoy what this Eastern European capital has to offer in terms of excitement and history. 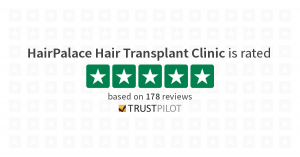 Read the patient reviews and see why Hair Palace is the top destination for Hair transplants throughout the world. We look forward to seeing you in Budapest in the near future! Please check out our consultation page for more!